82 different words they thought of when they considered this word. The computer program generated the Word Cloud below, making words contributed more frequently bigger in the final display, but the Cloud really helped everyone appreciate the range of ideas in the group! ought of grace as a characteristic(beauty, wonderment, gentleness, peacefulness). 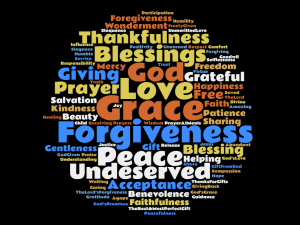 All these wonderful, heartfelt responses describe a Gift, the relationship between Giver and Receiver, and the desire to communicate our thanks to God for this gift in prayer and action. mit to regularly giving Time, Talent, and Treasure to God through Immanuel. Intentionally remembering a special relationship (whether that’s a family member’s birthday or God’s abundant Grace in your life) demonstrates commitment to growing and nurturing that connection. Try just adding $1 to your weekly gift, week-after-week, until you reach a giving goal you set for yourself, and then maintain it. Try identifying a way to live your commitment during the week by targeting a specific type of other discretionary spending (coffee money every day, coupon savings or Shopper’s Club savings during the week, etc.) to re-direct to your church envelope. Help the children in your life learn about regular giving of time, talent and treasure by modeling and involving them in the process. Teaching an attitude of gratitude and involvement in Immanuel’s many programs is important. Setting a goal, acting on it (remembering the commitment), and then achieving it is Discipleship in action – joy-filled satisfaction! Sunday March 31 will be Consecration Sunday, when we’ll all be asked to present our Commitment Cards during both services. If you’re not able to attend next Sunday, please return your Commitment Card in the pre-addressed envelope included with the mailing you’ll receive. Please think about all the things we’ve talked about over the past several weeks — hopefully they’ve been interesting and thought-provoking. Our hope is that we’re helping to “connect the dots” between God’s freely-given Gift of Love, Mercy and Grace to each of you, your response to that Gift, and what your response does in terms of enabling God’s Hope for the World. Please think and pray about how you can live out that relationship through your thankful giving in response to all God has given you personally and through Immanuel.